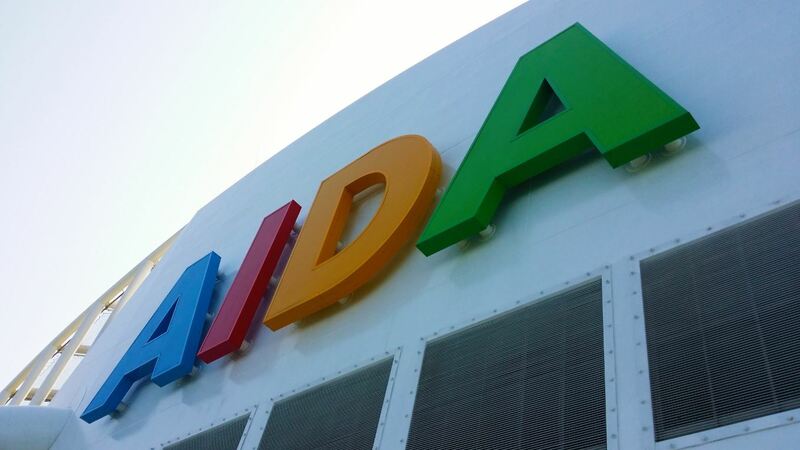 Last week we finally had the chance to visit AIDAprima, the youngest member and new flag ship of AIDA Cruises. 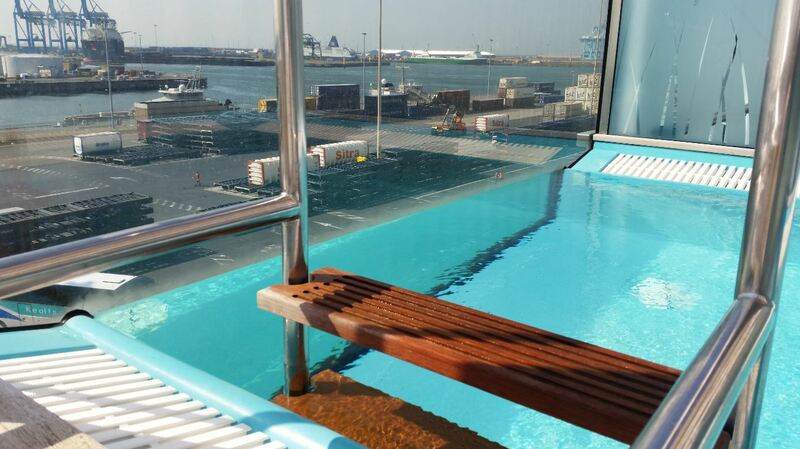 AIDAprima is the first ship in a new generation of technologically advanced cruise ships. For example the ship uses MALS -Mitsubishi Air Lubrication System- a method to reduce the resistance between the ship’s hull and seawater by using air bubbles and while in port the ship runs on LNG – liquefied natural gas. 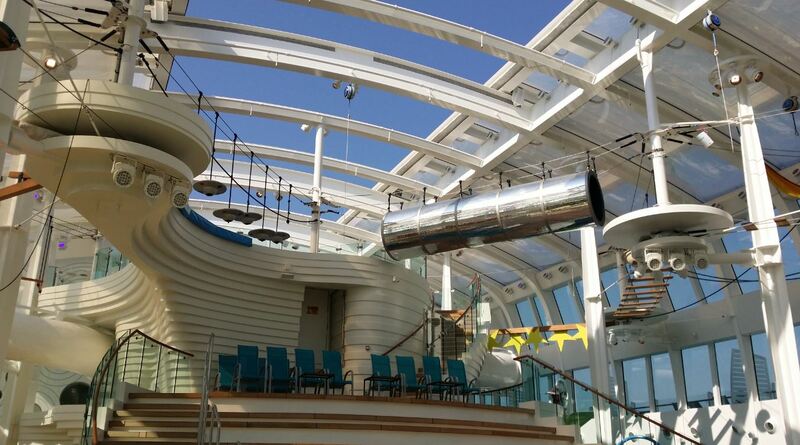 Weighing over 124,000 ton, the 300 meter long luxury cruise ship accommodates 3,300 guests. 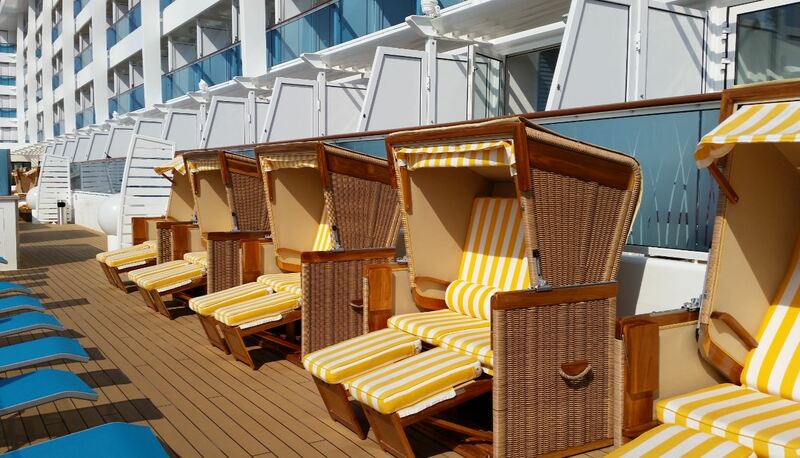 Spread out on 17 decks guests can explore 12 restaurants and 3 snackbars, 14 cafés and bars, a beach club, a sports and activity deck, a full spa and fitness area, a lazy river and much much more. In fact there is so much to explore on board AIDAprima, you might not have enough time to recuperate in one of the 14 different stateroom categories. 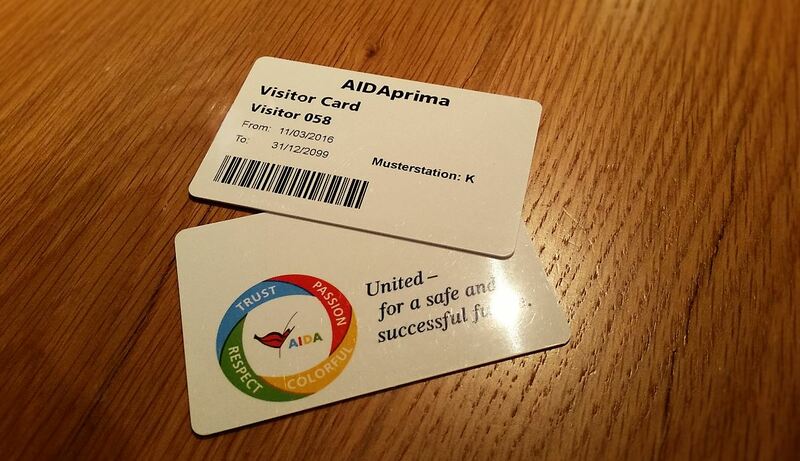 But enough boring technical details, time to get better acquainted with AIDAprima and AIDA Cruises. 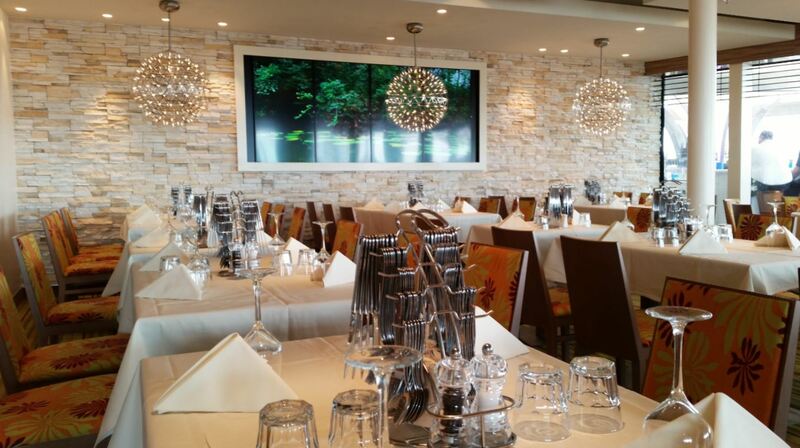 Our first stop after boarding the ship is the Markt Restaurant. 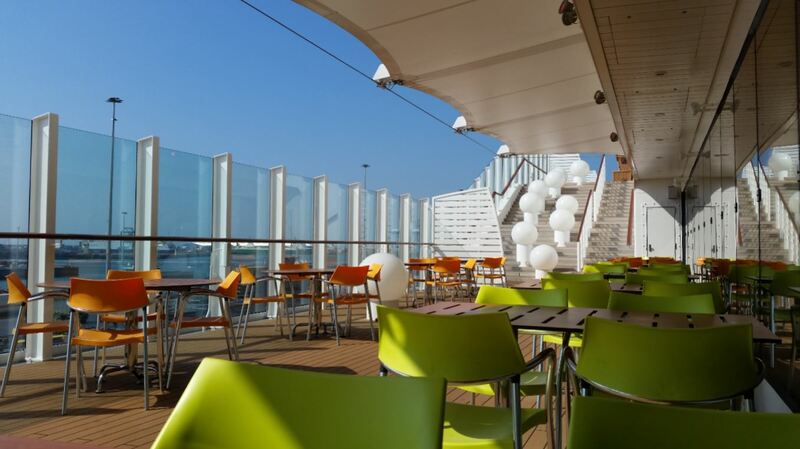 One of the major differences between AIDA Cruises and other cruise lines is that AIDA ships in general do not have a main dining room and all meals are enjoyed in buffet-style restaurants. 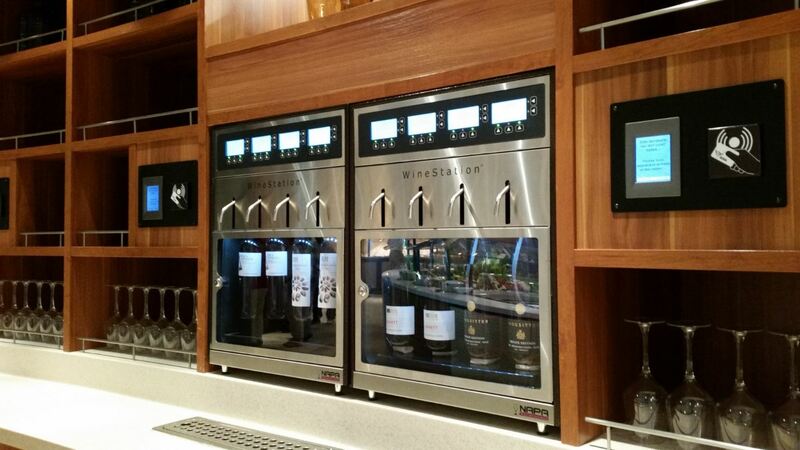 Furthermore all drinks, such as wine, beer, water and soda’s, in the buffet restaurants are complimentary. 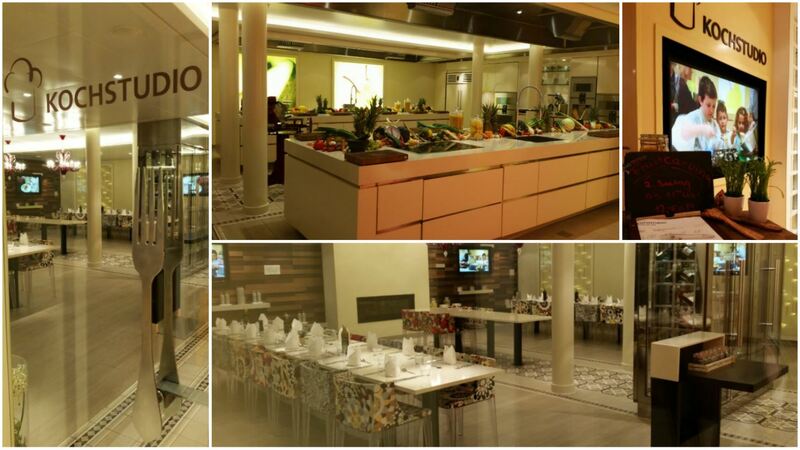 On board AIDAprima there are five buffet restaurants. 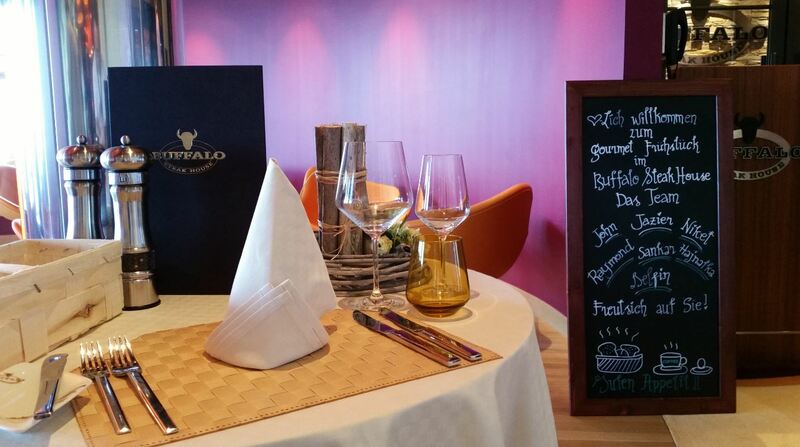 The Bella Donna Restaurant serves Italian inspired dishes, the East Restaurant offers Asian style food, the Weite Welt Restaurant serves specialties from all around the world and while the Markt Restaurant is the place for seasonal dishes, the Fuego Restaurant has a special buffet for the little cruisers. 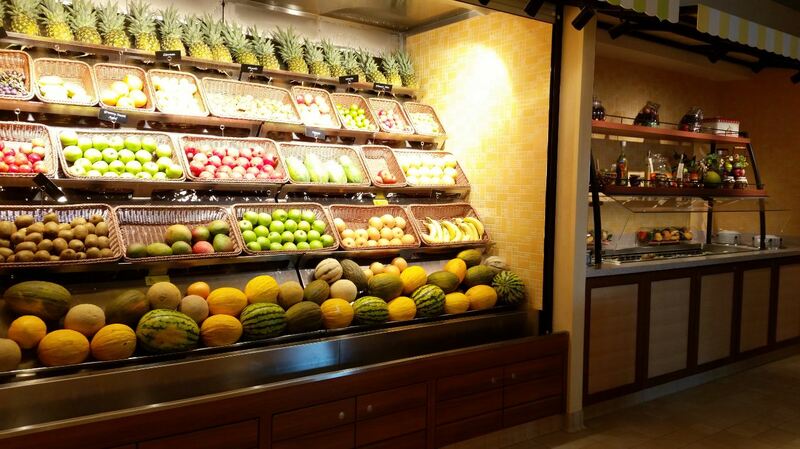 Part from the main buffet restaurants AIDAprima offers three specialty restaurants. When dining in these restaurants a small cover for the drinks applies. 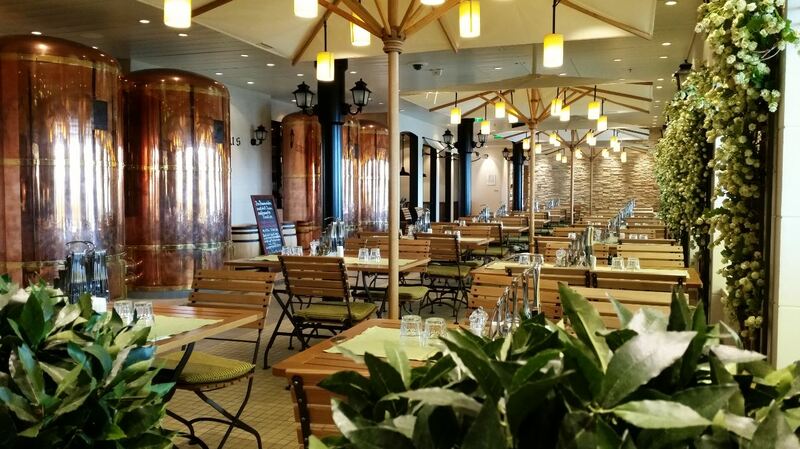 The Casa Nova Restaurant offers Venetian specialties, the French-style brasserie French Kiss serves French cuisine and Brauhaus, the German-style tavern is the place to consume typical German dishes while sipping on a beer from the onboard brewery. 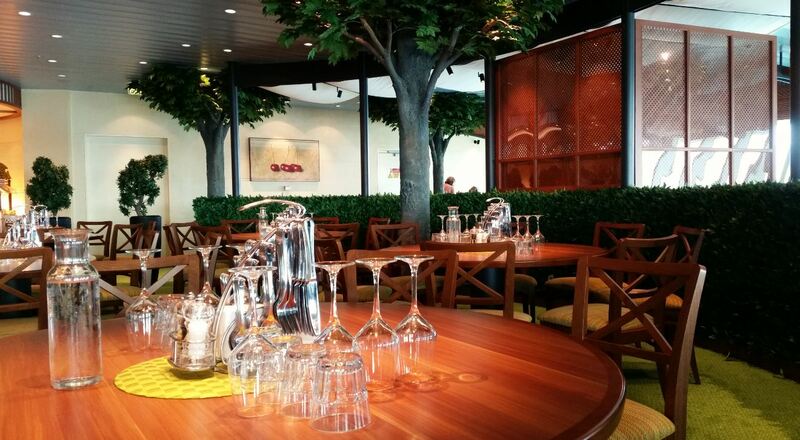 The four a-la-carte restaurants carry a cover charge for the food and drinks. 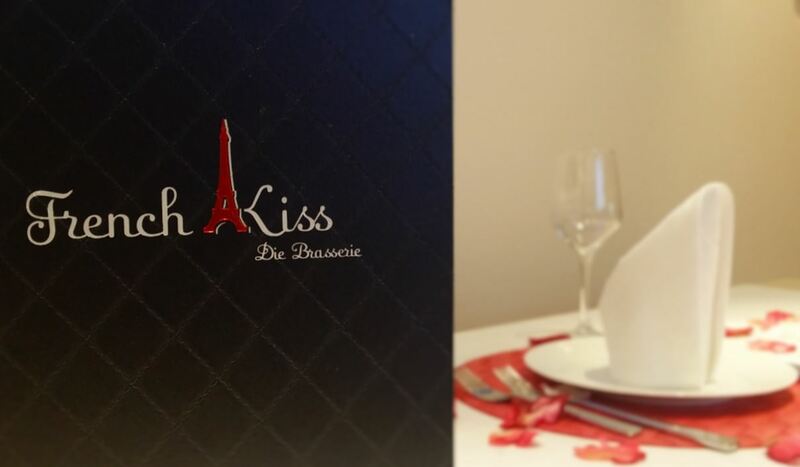 They are Buffalo Steak House (guess what they serve), the gourmet restaurant Rossini for top notch cuisine, Kochstudio where guests can get creative during cooking classes and Sushi Bar which offers the finest Japanese specialties. 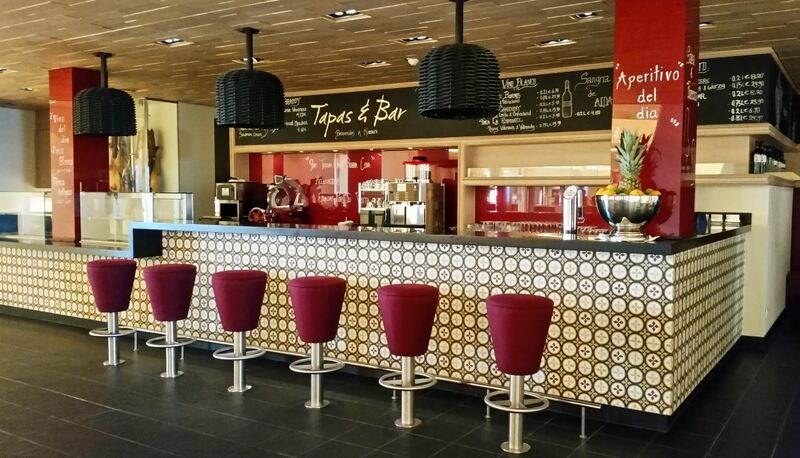 Finally for those small cravings AIDAprima has three snack bars: Sharfe Ecke, for German Currywurst, Pier 3 Market, a giant mini bar where you can get coffee and croissants for breakfast and other snacks during the day, and Tapas & Bar serving Spanish tapas or snacks. 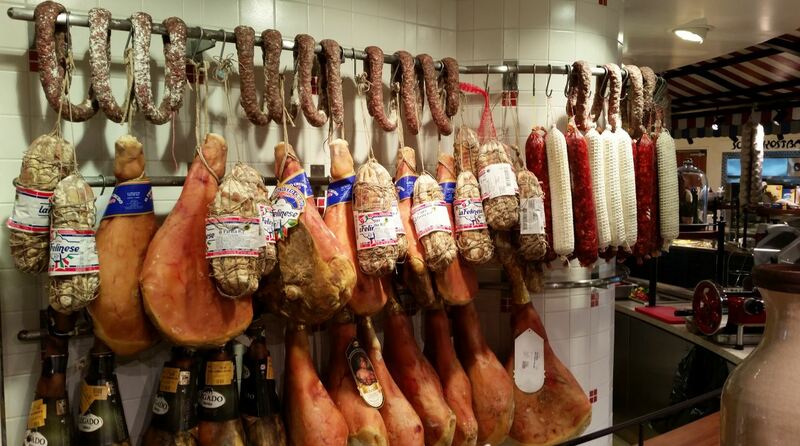 Having sampled the food offerings in the Markt Restaurant it was time to begin our exploration of AIDAprima. 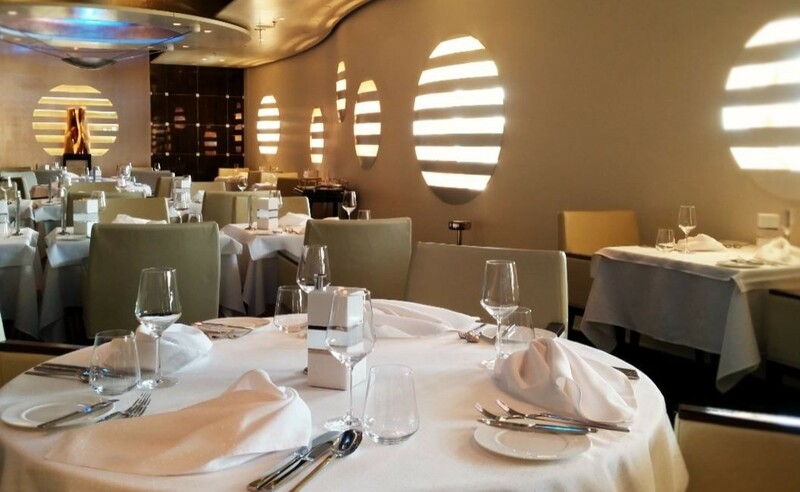 As we exit the Markt Restaurant we walk past the Bella Donna Restaurant, the Ristorante Casa Nova and the East Restaurant before arriving at the Theatrium, AIDA Cruises version of a theater. 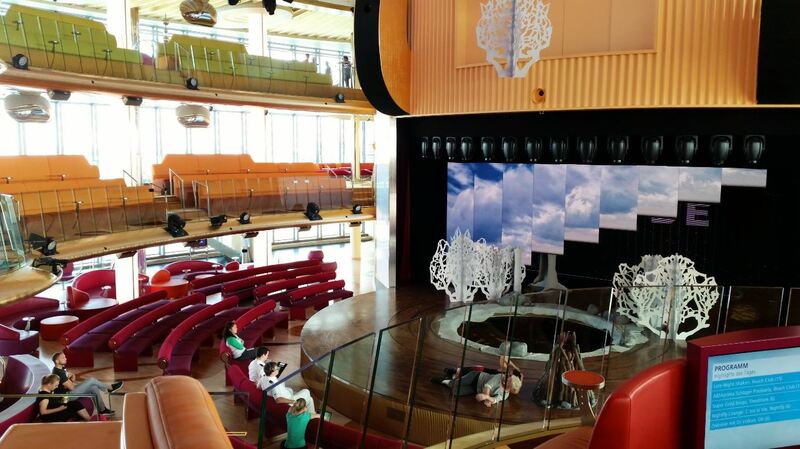 AIDA sets itself apart from other cruise lines by integrating its theater and the onboard atrium in to one big entertainment area, the Theatrium. Focal point of the 3-deck high Theatrium is a big 360 degrees circular stage covered by a huge LED sphere. Walking past the Prima Bar and the Casino Bar we pass by the obligatory casino towards AIDA Plaza, the ships shopping mall annex entertainment area. Spread out over two floors are a nail- and hair salon, shops, snackbars, an ice cream bar and a performance area for street artists. 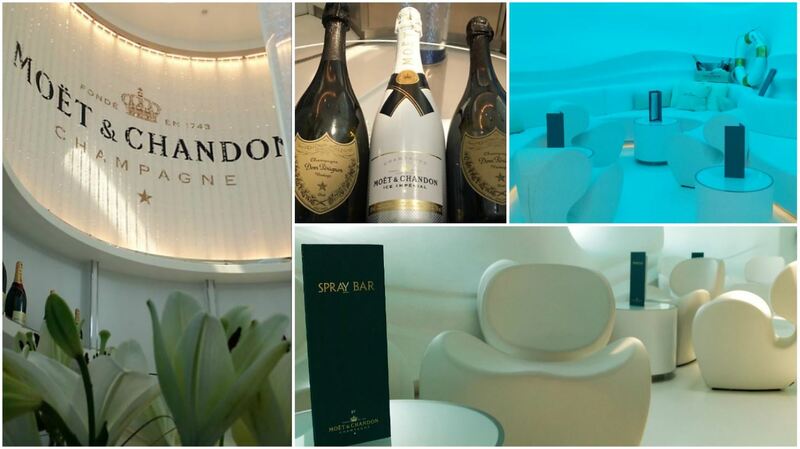 We walk past the Tapas Bar through the Nighfly Nightclub to arrive at Spray Bar by Moët & Chandon, AIDAprima’s luxurious champagne bar, spread over a two deck lounge with a terrace right at the front of the ship. Unfortunately we cannot stay here forever, there is more AIDAprima to discover. 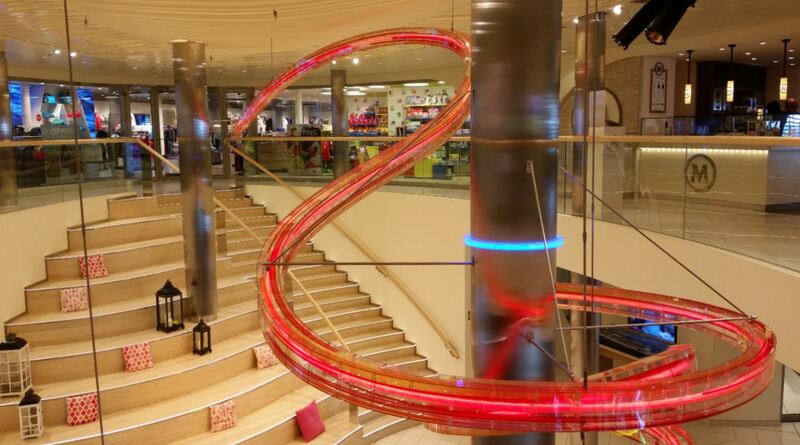 While dreaming of one day standing at the very front of the ship yelling “I’m the king of the world”, we walk back inside to climb the stairs to deck seven to find more stores and the first Magnum Pleasure Store at sea. 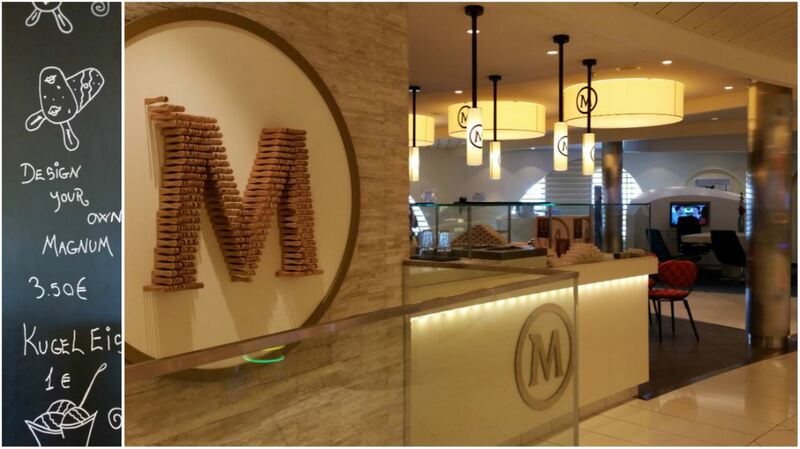 AIDAprima is the first ship where you can choose your favorite chocolate and topping to create your own personalized Magnum ice cream bar. 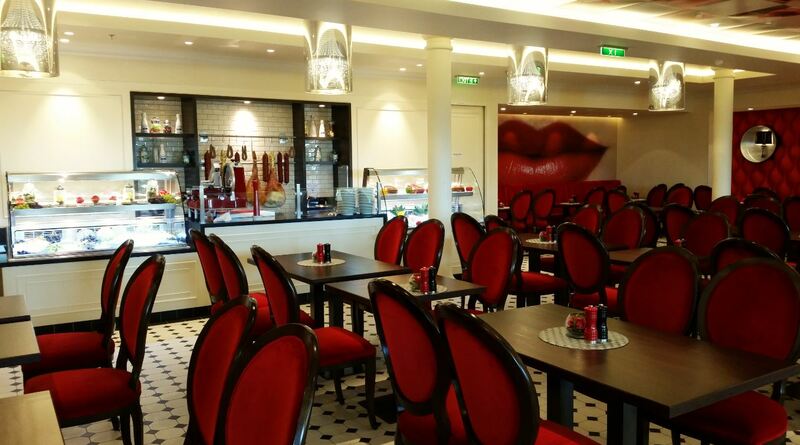 As we walk towards the back of the ship we have a sneek peek inside the Kochstudio (cooking studio) before enterring French Kiss, the French-style brasserie. 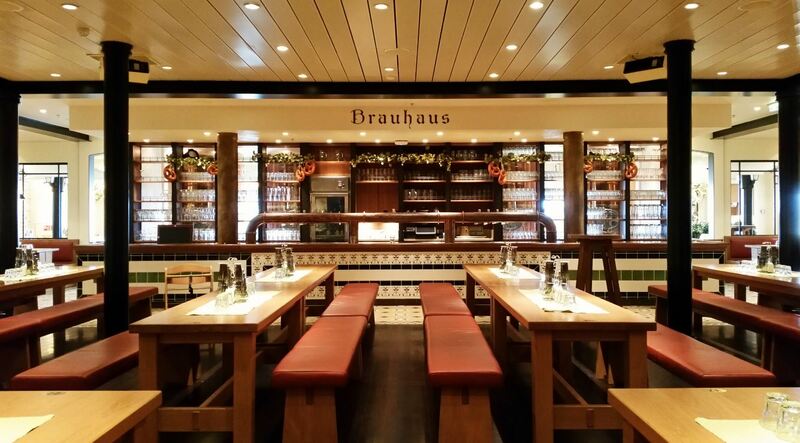 Travelling from France to Germany isn’t far, especially not onboard AIDAprima, as Brauhaus, the German eaterie is right next door. 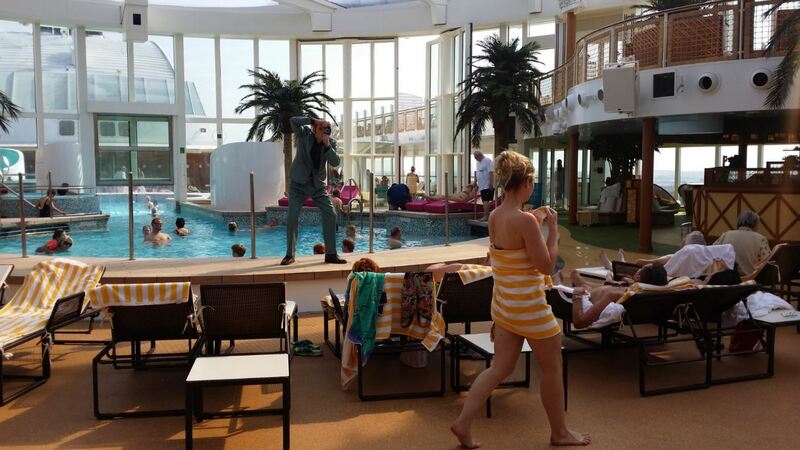 On deck eight there are three a-la-carte restaurants, some bars and, all the way in the front of the ship, the Organic Spa. The wellness area offers five sauna’s, two large sun decks, in- and outdoor jacuzzi’s and every beauty treatment imaginable. 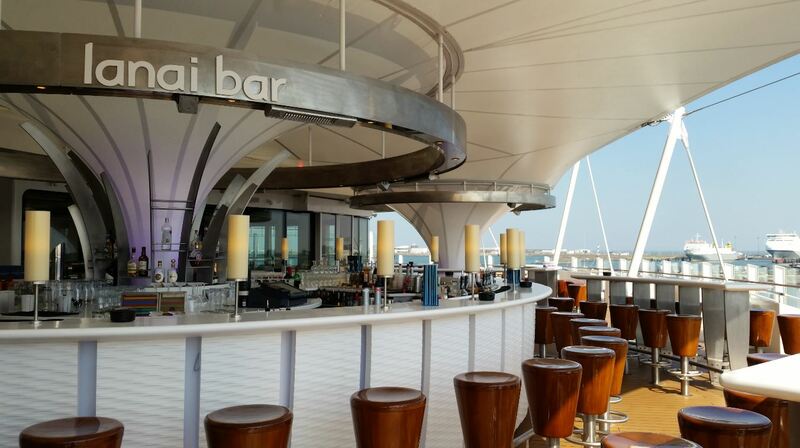 We head up to the Beach Club on deck 15. Solarium during the day, complete with pool area, pool bar and fake palm trees, the Beach Club turns into a party zone at night where live music, DJ’s and lazer shows are the essentials for late night beach parties. 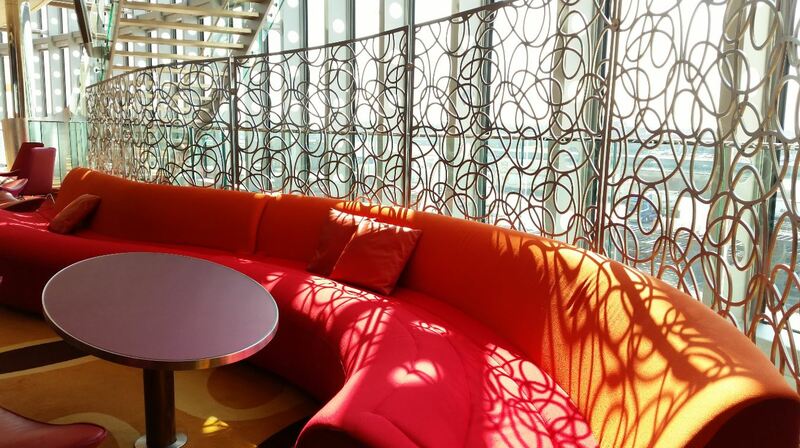 Water, air, earth, and fire are the four elements which inspired the design of the new Four Elements Activity Deck. Children of all ages can spend hours playing miniature golf, sliding down the two waterslides of the AIDA Racer, being carried away by the Lazy River or climbing the ropes course. 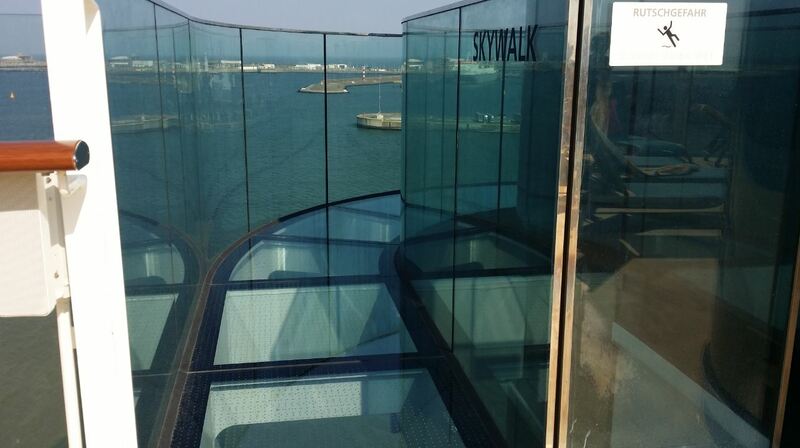 Outside the Skywalk, a glass walkway, offers great views and thrills 45 meters above the sea. 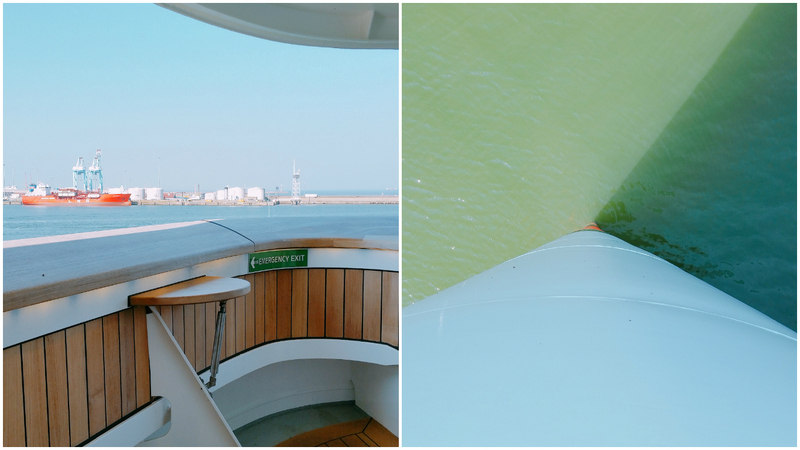 This was our first time on board AIDAprima, and the first time on any AIDA Cruises ship. 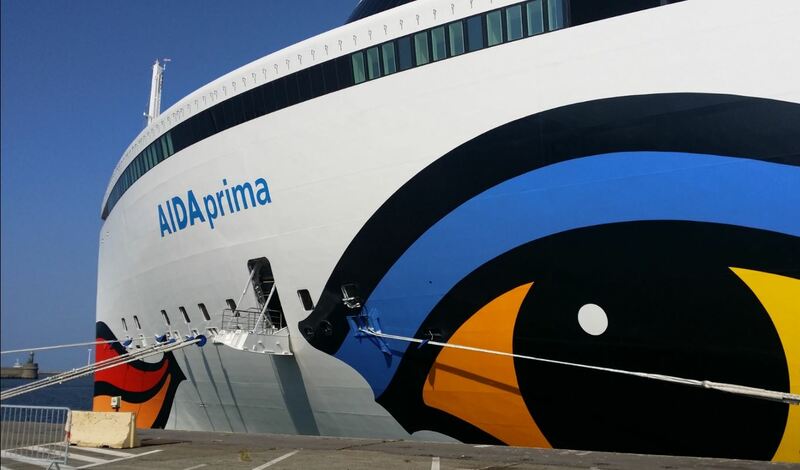 While we cannot say all ships in the AIDA fleet are alike, we can definitely say AIDAprima is unique. She is unique not only in her design but also in the the way looks and feels on the inside. 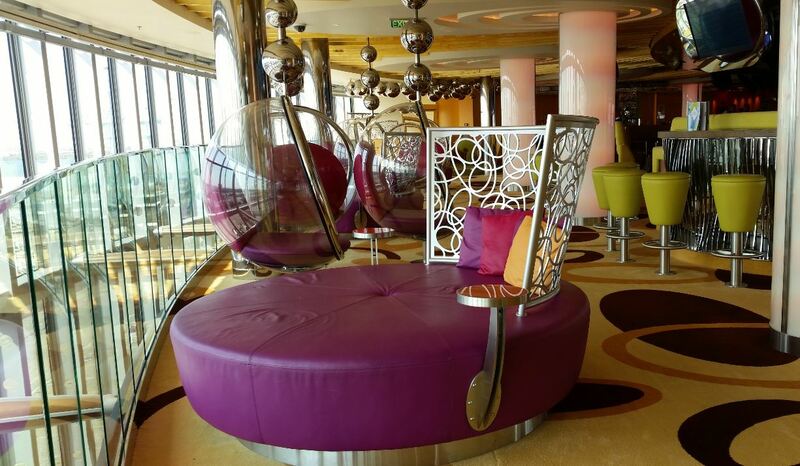 Modern, fresh, vibrant colours, design furniture and open spaces give her an appearance totally different from any other cruise ship we have been on. 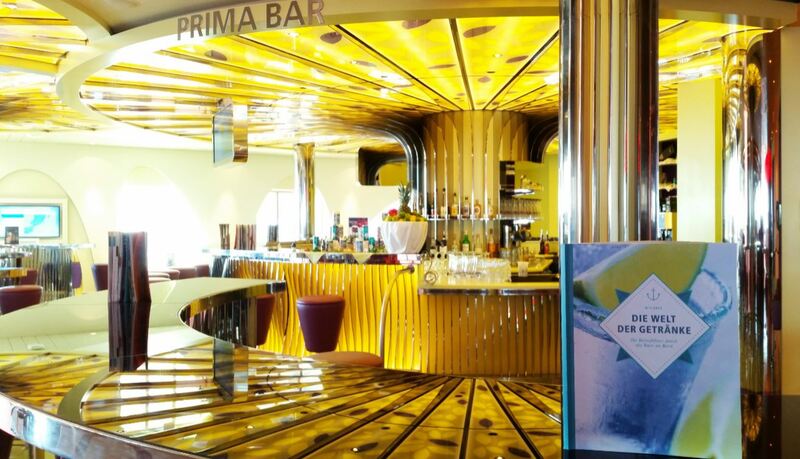 AIDAprima was announced as the ship that “will usher in a new age of cruising” and we have to admit the future never looked more exciting. Our visit was made possible by CLIA Belux en AIDA Cruises .